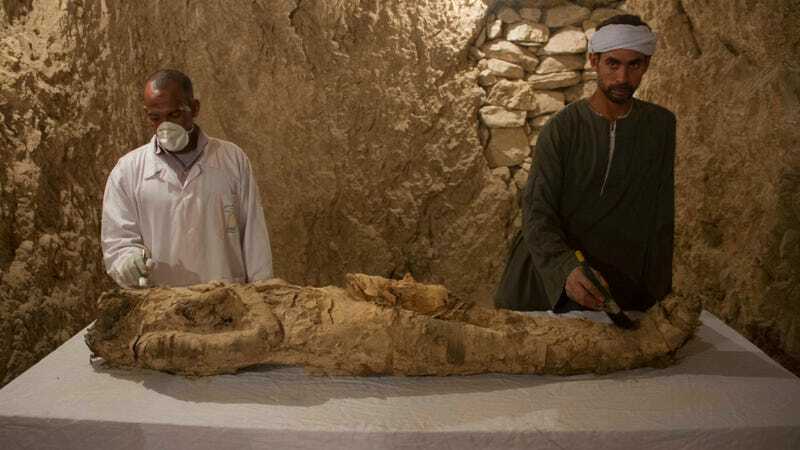 Egyptian archaeologists working in Luxor have explored two tombs dating back to the 18th Dynasty, uncovering colorful figurines, funeral masks, a stunning mural—and a linen-wrapped mummy. As National Geographic reports, these two tombs, found in the necropolis of Dra’ Abu el-Naga in Luxor, Egypt, were originally discovered in the 1990s by the German archaeologist Friederike Kampp-Seyfried. On Saturday, the Egyptian ministry of antiquities announced the re-discovery and excavation of these two tombs, designated Kampp 150 and Kampp 161, after languishing for nearly three decades. Kampp-Seyfried managed to excavate the entranceway to Kampp 150, but that’s as far as she got, and the tombs were quickly forgotten. It’s not entirely clear who the tombs were for, as there are no obvious inscriptions. What is clear, however, is that they date back to the 18th Dynasty (1550-1292 BC), and they were likely made for government officials who served at the ancient capital of Thebes. Kampp 150 is a mud-brick and masonry structure that’s larger than the other tomb. It contains five entrances that open onto a courtyard with a pair of shaft burials. This tomb is a full century older than Kampp 161, dating back to the reign of Thutmose I. The Egyptian archaeologists leading the excavation weren’t able to uncover any inscriptions or dedications, but they did find funerary seals bearing the names of a writer, named Maati, and his wife, Mohi. Excitingly, they also discovered funerary masks, colorful wooden statues, and a linen-wrapped mummy in the tomb. Kampp 161 is a single shaft burial, but with no remains. It does, however, contain a treasure in the form of an elaborate mural depicting some kind of social event, possibly a banquet, with a figure presenting offerings to the tomb’s occupant and his wife. Wooden funerary masks, furniture, and a decorated coffin were also found within this tomb. Analysis of the tomb’s style and architecture suggests it dates back to the reigns of Amenhotep II or Thutmose IV, placing it at about 3,400 years old. Egyptian archaeologists are now in the midst of an incredible run of discoveries. Back in April, they uncovered the tomb of an 18th Dynasty magistrate named Userhat within the same necropolis, along with a thousand figurines, eight mummies, and 10 wooden sarcophagi. Importantly, these excavations have been made without the help of foreign archaeologists, suggesting a newfound confidence and professionalism within archaeology in Egypt.